The Omega Diet is a health focused plan that is based on a Mediterranean dietary approach. The author, Dr. Artemis Simopoulo, outlines the differences between the omega 3 fats that are found in fish, certain oils and green vegetables, and omega 6 fats that are found in poultry, grains and most vegetable oils. She explains that omega 3 fats have heart protective and cancer preventative effects as well as being beneficial for conditions such as chronic fatigue syndrome and arthritis. Conversely excessive or imbalanced intakes of omega 6 fats are a major cause of obesity, heart disease and depression. This is not a diet in the traditional sense but more of a guide of how to change your eating habits so as to create a balanced intake of the different fats in the diet. It is primarily focused on the benefits to health that can be achieved with this approach to eating, with weight loss regarded as natural consequence of this, rather than a goal in and of itself. Simopoulo explains the problems with low fat diets and how fats play an essential role in health as well as weight management. The key is to replace food sources of omega 6 fats in the diet with those higher in omega 3 fats. She conveys to readers that it is not necessary to feel deprived when eating a healthy diet and makes the point that exactly the opposite is the case because when you feel satisfied with nutritious meals you are less likely to overindulge in unhealthy foods that can lead to weight gain. Omega 3 fats also have been shown to have beneficial effects on normalizing metabolism. The foundation of the plan is ensuring an adequate intake of omega 3 fats along with a wide range of fruits and vegetables with at least seven serves recommended daily. Leafy green vegetables are especially emphasized, as these are a source of omega 3 fats. Other foods that are highlighted include fatty fish such as salmon and mackerel, walnuts, flax and canola oil and legumes. Whole grains are recommended while refined carbohydrates such as white rice, white bread and pasta are to be avoided. An ounce of cheese is allowed every day. Find other Mediterranean inspired recipes here. The Omega Diet retails for $14.95. Reduces the risk and can help with the management of many chronic health conditions. Provides a good selection of recipes. Dieters can eat satisfying meals and won’t feel deprived. May not be suitable for carbohydrate sensitive individuals as the diet is relatively high in grains and fruit, although this could be adjusted. Overemphasizes the use of canola oil in the diet, which appears to be lacking in scientific support for its effects on long-term health and is not a part of the traditional Mediterranean diet. Will not appeal to those who prefer precise plans and calorie counting. 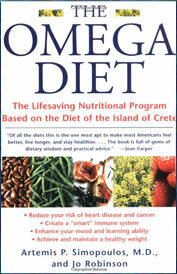 The Omega Diet will result in improvement of health for practically all dieters who commit to this plan as most people have an imbalance in the ratios of essential fats in their diet, however it is especially of benefit to dieters who are also struggling with conditions such as diabetes, heart disease, depression and arthritis. With the possible exception of the advice to increase canola oil intake this is a very balanced and highly nutritious dietary approach. The emphasis is on improving health but for most people this will also result in weight loss that will be able to be maintained over the long term. Switch to olive oil and this diet is dynamite in all respects. Omegas are the way to go!!!!!!!! !